You CAN teach an old park new tricks. 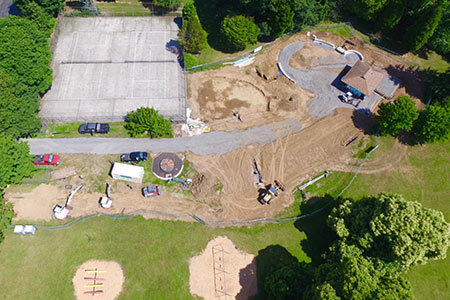 Seventy-eight-year-old Fernhill Park will soon sport a new splash pad, the thoroughly modern version of running through a sprinkler. Splash pads have replaced wading pools in several Portland parks. 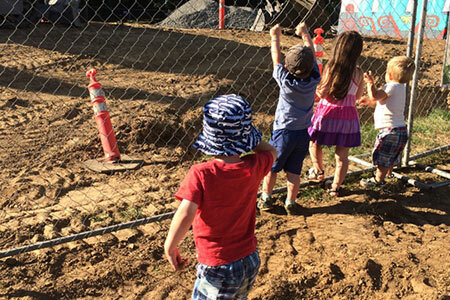 According to Portland Parks and Recreation project manager Travis Ruybal, children of all ages love the opportunity for water play provided by these features that shoot water into the air to allow a fun cool down on hot summer days. Another benefit of splash pads is no city employees are needed to operate them, and parents are expected to supervise their children playing. Restroom renovation is part of the project, with relocation of doors and windows in line with ADA requirements. Travis said he plans to invite the Beaumont Middle School students who last year painted the murals – one on each of the four exterior walls – to touch up and add to the mural when the renovations are complete. Additional project elements involve water service lines, benches and irrigation improvements. New amenities will also include bike racks and updated drinking fountains, as well as additional picnic tables. New sidewalks and pathways are being added to make the park more accessible for all members of the community. “The improvements will provide enhanced opportunity at the park, allowing the community to come recreate together at the new splash pad, paths and the other furnishings,” Travis pointed out. These new amenities join the current baseball field, dog off-leash area, horseshoe pit, paved paths, picnic tables, playground, soccer field, softball field, tennis court, track and volleyball court on 26.63 acres. The park is open daily from 5 a.m. until midnight, and the splash pad will be open from 11 a.m. to 7 p.m. through Labor Day. Travis said construction is slated to wrap up this month, with an Aug. 25 grand opening of the splash pad. Keep an eye on Facebook.com/groups/ConcordiaPDX for details. The costs for the project total $1.25 million dollars, with $500,000 provided by the Parks Bond Development Measure voters approved in 2014 and $750,000 from System Development Charges (SDCs). Those SDCs are one-time fees assessed on new development to cover a portion of the costs of providing specific types of public infrastructure. They are for urgent repairs and other capital costs, not park operations. Rachel is a 16-year Concordia resident who loves her community. She has a background in counseling/education and uses her passion for helping others in her work as a real estate broker. Contact Rachel or learn more about her at RachelRichardsRealtor.com.